Although largely forgotten today, the "Teenie Weenies" cartoons enchanted readers of all ages for more than 50 years. 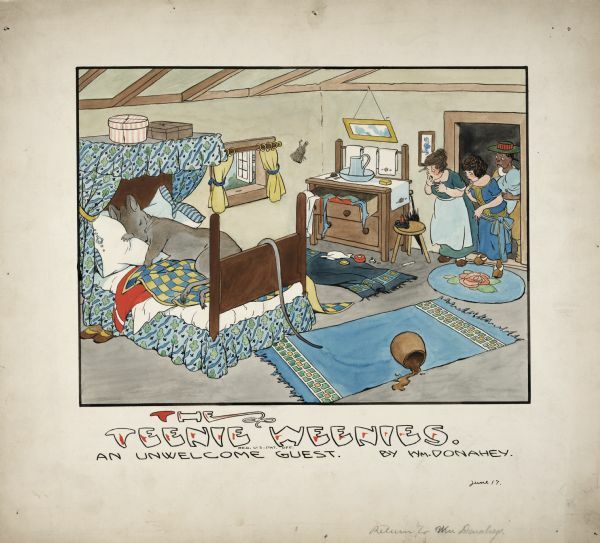 Created by William Donahey, the diminutive Teenie Weenies, a self-sufficient group of hardworking and courteous two-inch-tall people, appeared in newspapers, books, and on a variety of licensed products between 1914 and 1970. This gallery highlights about ten of the several hundred original drawings and paintings Donahey created to illustrate his cartoon strips and books. All of the originals are available to view in the Archives Research Room. Cartoonist William Donahey was born in Westchester, Ohio, on October 19, 1883. An introverted child, he spent much of his time alone creating an imaginative world of small, strange creatures, which he later credited as the birthplace of the Teenie Weenies. Donahey's parents, noticing his creative streak, enrolled him in the Cleveland School of Art, hoping that he would follow his older brother into the newspaper illustration business. After graduating in 1903, Donahey worked briefly in advertising before joining the staff of the Cleveland Plain Dealer, where his brother was the political cartoonist and where he met his wife, columnist and children's writer Mary Dickerson. Donahey began specializing in children's cartoons while working for the Plain Dealer. His wife introduced him to some of the traditional children's stories he had missed as a child, such as "Arabian Nights," "Alice in Wonderland," and "Mother Goose" rhymes. Donahey started illustrating "Mother Goose" rhymes, preferring their gentle verses to what he considered the violence of contemporary children's stories. He also composed his own poems and stories. When the editor of the Chicago Tribune saw Donahey's original creations, he offered him a regular position as a cartoonist. The Teenie Weenies stories consisted of one large illustration and accompanying text about the lives of some forty characters that lived beneath a rosebush in structures made out of hats, an old boot, jugs, and a rusty tomato can. The first feature appeared in black and white on June 14, 1912. Color was quickly added and in 1923, it moved to the regular Sunday comics section. The Teenie Weenies proved so popular that it was soon syndicated in newspapers around the world. The characters also appeared in books, school primers, and advertising, as well as on handkerchiefs, tin boxes, decals, dolls, and clothing. Donahey also had a number of licensing agreements for his work with companies like Monarch Foods and Reid-Murdoch. Donahey poured most of his energy into his newspaper cartoons, though, retiring from the paper only a few months before his death in 1970. This online gallery represents only a fraction of the extensive collection of original Donahey drawings and other material held by the Society.